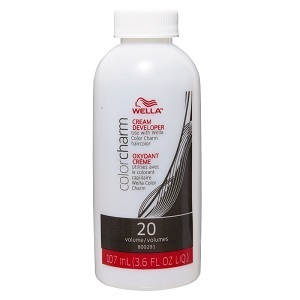 Mix 1 part Wella Color Charm color with 2 parts Wella Color Charm cream developer. Apply to the hair using your desired technique, develop for 30 mins and up to 45 minutes if additional depth or gray coverage is needed. For Professional Use Only. Read and follow instructions carefully. Water, Hydrogen Peroxide, Cetearyl Alcohol, Styrene/VP Copolymer, Disodium Phosphate, Sodium Lauryl Sulfate, Phosphoric Acid, Salicylic Acid.